You’ve been living in France for a little while now. 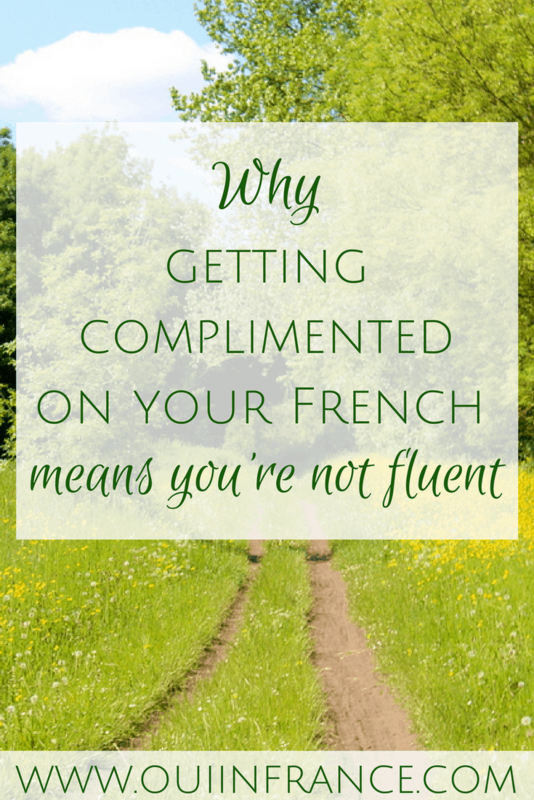 At first, it might seem like a good thing when native French speakers compliment your French. Yay, someone has noticed! You feel proud, accomplished and like you’ve made progress… and you should feel all of these things. Congrats! Language learning is hard. But the real marker of progress is when native French speakers stop complimenting you on your French. That’s when you know you’ve majorly improved. Yes, really. Why is this the case? Let’s talk about why compliments mean you’re not fluent. Compliments are awesome and I go out of my way to compliment others. But when we’re on the topic of language learning, compliments can be kind of weird. 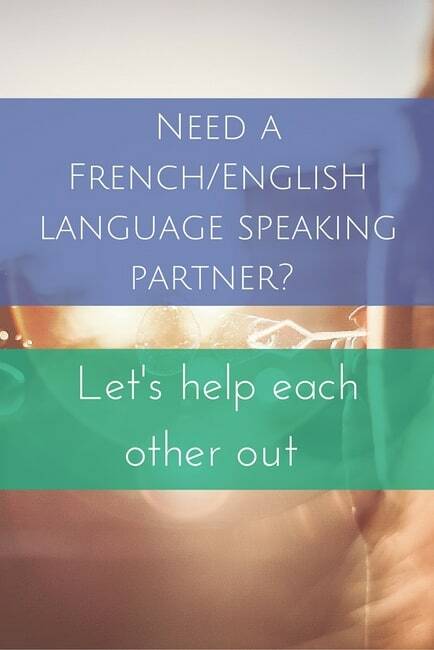 In certain situations, you’d expect a compliment on your French language skills and it’s only natural and welcome, so let’s start there. Compliments from your language teacher or fellow students. In any type of learning context, encouragement and pats on the back are expected and common. From your friends and family (or other expats) who know you’re learning that second language. These people know you — they know your triumphs and your struggles, your good days and bad. Those close to you will absolutely want to encourage you with kind words. They may be really impressed and know your journey. It’s about offering support. After specifically asking someone their opinion on your level of French. People don’t want to hurt others’ feelings, so most of the time we tell people they’re doing a good job and focus on the positives. This post is not about the situations above. What I’m referring to here is a different group of people. You know the ones, those random acquaintances or even people you’ve just met who proclaim that “your French is really good!” or something to that effect, with a little hint of a smile and encouraging tone. Maybe they tell you this after you just clawed your way through a particularly difficult sentence. Or after you mispronounced something and had to repeat it a few times. Or after you stumbled. Or from a waiter after you’ve just ordered a beverage. Or the guy at the hotel front desk upon your arrival in France. These types of compliments are sincere, sure, but they’re also trying to make you feel better. There’s nothing wrong with that and sometimes it feels great to hear someone who has no stake in the game tell you that you’re actually good at their language! Most of us at our core just want to encourage others. But what does someone complimenting your French mean? That you’re far from fluent. The longer we’re here, the less frequent it hopefully becomes. Really, being told nothing is a good thing. It’s almost insulting to tell someone who has been living in a country for several years and can communicate that they’re good at a language. Think of it a different way — do you compliment other native English speakers on their English? Of course not. They speak the language like you do. No issues whatsoever, so telling someone who speaks just fine without any hurdles is overkill. Accent or not. 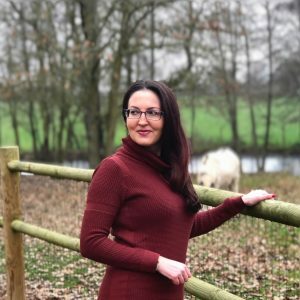 And yes, I get that the person with the accent isn’t a native speaker, but if the accent doesn’t prevent them from communicating just fine, does it matter? Would a compliment come across as more of an insult? Again, I’m talking about compliments from random strangers and not people who you know well. And yes there are exceptions, like speaking a less common language where it’s rare to hear someone with an accent at all. If you speak a rare language fluently, it may surprise people so they will compliment you. That’s different. But back to what I was saying. If you have no trouble expressing yourself and rarely stumble, why would someone who doesn’t even know you feel the need to compliment your language skills? They don’t know your story or how far you’ve come. Really, fewer compliments means you’re improving even if that seems counter intuitive on the surface. ItchyFeet even made a comic about this concept! So if you’re living in the country where the language is spoken and have noticed a decline in the number of people who have complimented your language skills, don’t be discouraged — this might actually mean that you’re fluent! What do you think? Have you noticed that you’re getting complimented on your French less frequently the longer you live here? You nailed it. My level of French has become a non-issue. No compliments, no remarks. I am remembering co-worker who arrived from the U.S. boasting that he was fluent in French. We all went to a restaurant, and everybody ordered in French–completely normal, right? The waiter just didn’t understand his order, despite his repeating it several times. The co-worker huffed that the waiter had a problem. I suspect the co-worker had been told over the years that his French was “really good” and he believed it. In fact, he couldn’t get out a complete sentence. Yes, exactly. 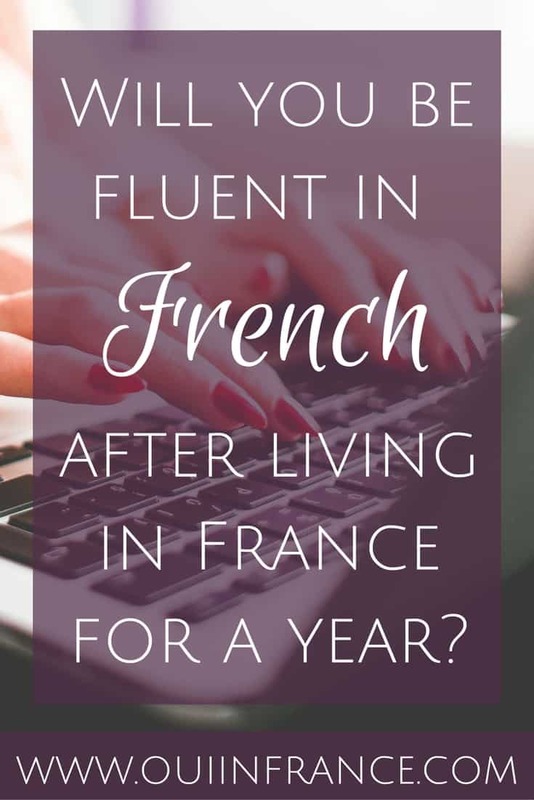 You may have an accent but you have no problem going about your daily life in French. There are still curious people who may ask where you’re from but no one feels the need to say “wow you’re great at French” because you speak like everyone else. I think it’s especially hard when you first arrive in France to live and realize the classroom French is far from the ‘real’ French you hear every day. The learning curve is steep as you adjust. Like your co-worker example, his French was probably great in his French class but with actual French people, he still had a long way to go! That’s a really great point as well. When I first arrived, I’d have to psyche myself up to call to make a dinner reservation or a doctor’s appointment. Now I just do it and think nothing of it. There are tiers of this “everyday French tasks” ladder, like after regular reservations, there’s going off-script and having a more complex convo with customer svc reps. Or something even more detailed or complicated. Depending on the task, I look up vocab in advance! ok this is SO true! I’ve never thought about it in this way either. I’m far from fluent and still beam when someone compliments me on my French because it is such a struggle. Cannot wait for the day when the compliments stop! or when I start dreaming in French! Yup, it’s most definitely a good thing! Is french really that hard to learn ? Il y a beaucoup de point difficile et c’est vrai que la différence entre l’écrit et l’oral est assez énorme, entre les liaisons, l’absorption de certaine voyelle et le subjonctif…I never realised it before. This is a great article. I’m always telling my clients that blending is good when you’re in another country meaning people don’t notice you’re an outsider by your behavior. Same goes for language. I will add this next time I’m speaking. Thanks. Je suis pas d’accord, je pense que c’est bien d’être complimenté, surtout par des français, ce qui est rare. Absolutely, we all start from somewhere and making an effort goes a long way! This is a really interesting way of looking at it. Sometimes when I’m getting to know people and they find out I’m American, they instantly compliment my French. I thought it was because the stereotype is that Americans only speak English and they’re surprised I can speak another language (same thing happens in Italy when I speak Italian). A few months’ ago I was at an obligatory two-day training put on by OFII for new residents. I had to go because I changed my status, even though I’ve been living in Paris several years. We had to go around the room and tell something about ourselves. I barely got two words out when the instructor complimented me on my French and asked if I’d learned in France or in the US. There were no other Americans in the class, so I felt kind of singled out, but the French don’t give compliments that much, so I took it as a positive. But at the same time, I always feel like oh, good American, you learned another language! So I was feeling kind of good about myself, but you’re right, I have to get to the next level where they say nothing. I’m a long way from fluent, but it doesn’t help that when people hear my accent they want to speak with me in English. None of my French friends with the exception of one or two want to speak French, they speak only English with me and it really is challenging. No Karina, you’re doing great!! The instructor who complimented you was sincere! It depends on the context like I pointed out in the post. 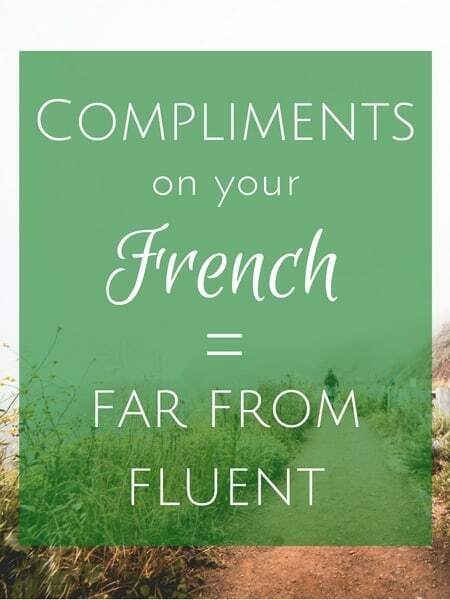 You were at an OFII training for new residents (most of whom probably do not speak French as their 1st language) so it’s only natural you were complimented in that situation. Keep practicing — you’re awesome! Hi JD, what is your question about “on”? You mean the French word “on”? Sorry, wasn’t sure what you were asking here but happy to help if you let me know!